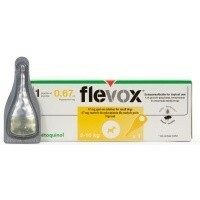 Flevox Small Dog Flea Treatment is a Fipronil based spot on flea treatment for smaller dogs weighing between 2-10kg. The treatment will remain effective for up to 8 weeks against infestations and newly arriving fleas will be killed within 48 hours. The product can also be used as part of a treatment strategy for Flea Allergy Dermatitis (FAD) where this has been diagnosed by a vet previously. Just like the next person I love a bargain so with this product being made by Vetoquinol I thought sure lets give it a go! You know the saying you get what you pay for? Well with this product unfortunately the saying is true. I have found five fleas on my dog and a few on my cats - " It takes 48 hours to work and then the fleas will be slowing down and dying they are the ones your seeing." It's been a week since application and as to slowing down these are the Linford Christie of fleas and they were going for gold on my dogs stomach. I am sceptical of reviews on products for flea treatments. Having worked in veterinary practice for over 10 years I have put my animals under more risk of becoming infested with all the flea ridden creatures that passed through the doors on a daily basis(not to mention the 20+ stray cats we cared for as an overflow for the local RSPCA). I did the flea clinics for our clients and gave out all the advice, I know not to bath my dog before treatment, I know to treat the house and the house of anyone I visit regularly (and the car)to stop the eggs hatching out and I know to reapply on a monthly basis for at least three months following an infestation. Having lived on site for 7 years I used Frontline Spot-On, Staykill or RIP Flea and never have I had a problem with fleas. I am allergic to the saliva they inject so if there are fleas about I usually get bitten also - this is what causes your pets to scratch - but only if they are allergic, animals that are not allergic to the numbing saliva of the flea will not scratch. I have now left practice and have a bigger infestation than ever before. I just placed an order for Frontline and RIP Flea which is cheaper than most others and comes in a bigger can - go figure! I won't make this mistake again - I never bother to leave a review due to lack of time but I felt I needed to inform other people thinking of buying this product that it has performed below par. Pretty disappointed in this product - obviously this is in no way the fault of VetUK who I think are ace and compared to everyone else provide products at a reasonable price.